You can use different flavors of ramen noodles, my family just happens to prefer the chicken flavor. Beef is a close second. I usually mix the slaw mix and green onions together in one bowl and keep the nuts and ramen noodles in another bowl separate from the slaw mix. 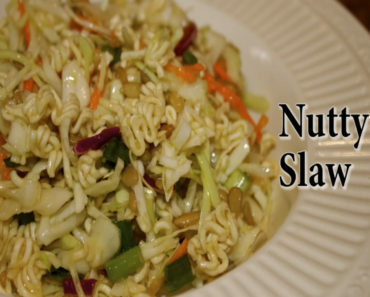 The night before serving, I mix the slaw, nuts and dressing together so everything remains crunchy! This is a great dish to take to potlucks, which is where we first had it. It has such great flavors. The slaw doesn’t last long around here! You can add some grilled chicken on top which makes it a complete dinner or lunch! Mix dressing in a separate bowl.